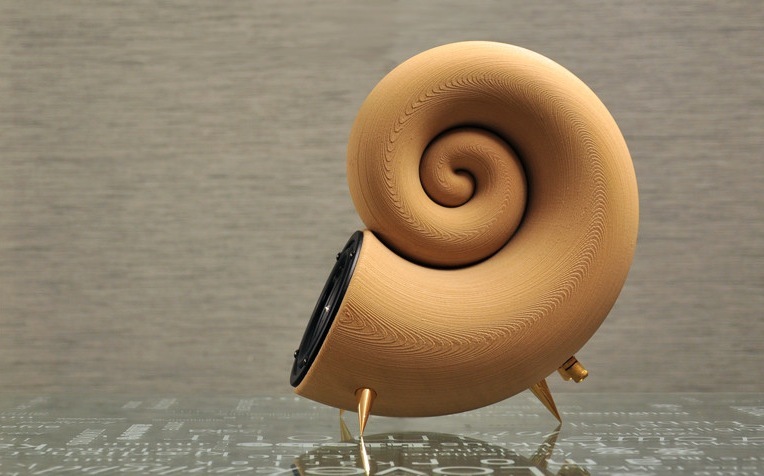 The 3D printing team at AKEMAKE has just unveiled Spirula, the world’s first 3D printed speaker made from 100% wood. Designed in a spiral shape inspired by the deep sea Nautilus and squid, the Spirula is a small and timeless piece that can fit into any home or office environment. In addition to a limited edition of the Spirula that AKEMAKE has produced for purchase online, they’ve also included the specifications and DIY guidelines so that anyone with a 3D printer and filament can print their own at home. How can you print wood?! The guidelines on the site say "PLA". The 3D printing team at AKEMAKE has just unveiled Spirula, the world's first 3D printed speaker made from 100% wood. Designed in a spiral shape inspired by the deep sea Nautilus and squid, the Spirula is a small and timeless piece that can fit into any home or office environment. In addition to a limited edition of the Spirula that AKEMAKE has produced for purchase online, they've also included the specifications and DIY guidelines so that anyone with a 3D printer and filament can print their own at home.